If the Ethernet interface of the Solar Frontier power inverter is connected to a router, the data in the inverter’s data logger can be transmitted directly to the Solar Frontier PowerMonitoring. The portal is easy to set up: A link at the bottom leads to an input mask for the system data. Besides the location of the installation, users simply enter the serial numbers of the installed inverters. If the system owner agrees to allow his system data to be published on www.powermonitoring.solar-frontier.com, he will be able to use the PowerMonitoring free of charge. The software interface is organized for maximum clarity. Besides the system data, the energy yields are shown in a daily, weekly, monthly or yearly profile. Current yield values for the system are evaluated on a scale and compared with values from other systems in the same region. So users can see at a glance whether their yields are higher or lower than the average for the region. They can also see their environmental contribution very easily in a display that shows how much CO2 has already been reduced because of these yields. The yields from the selected photovoltaic system can be displayed in a daily, weekly, monthly or yearly profile. 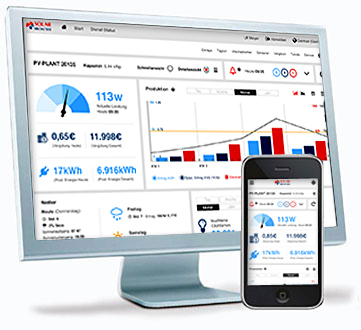 Now you can monitor the output of your PV system for free with the Solar Frontier PowerMonitoring. Via the intuitive user interface you can access yield data anytime and anywhere – even from your Smartphone or Tablet.